Please, in the Marvel Universe this is your average Wednesday. If you want to see my review of the first miniseries in trade form here it is, but there isn’t any real connection between the two. The link goes to an overview, but there are links to each issue in the story as well as my overall review of the trade from The Clutter Reports. Iron Man and the Human Torch are helping the military train to deal with supervillains when they’re interrupted by Rogue. While Johnny and Rogue play a little cat-and-mouse and Iron Man tries to keep down the collateral damage they don’t realize they’re causing all three, along with other heroes around the planet, disappear. They’re taking to a spaceship with an offer to received great knowledge in exchange for a little entertaining combat. Because that always goes well for the gladiators. In his sealed armor, Iron Man is unaffected by the nanites in the air, which give the heroes visions of their heart’s desires. (Speaking of which, is Vision among them? Can the nanites affect machine people as well as biological people?) The people behind the event aren’t happy with Iron Man being uncontrolled and set up a series of fights for him first to get him out of the picture. While Iron Man wins his first fight against Psylocke he appears to lose the next one against the then current incarnation of X-Force. What they got right: The nanites explain why the heroes would fall for the “fight for us and we’ll give you rewards…oh don’t worry, the loser is sent home all okay” line. (Although Tony notes that the teleport beam that took Psylocke out of the arena wasn’t powerful enough to send her to Earth.) 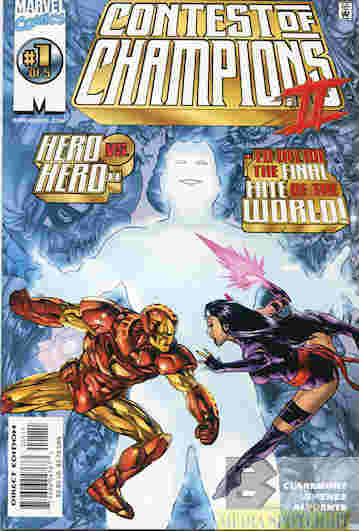 If you like hero versus hero fights this is a good one, and shows that Iron Man is more than a high-tech suit of armor. What they got wrong: If you like exposition you’ll love this issue. While some of it works, like Tony figuring out what’s going on or the profiles of his opponents, there are also times like the one where he’s thinking to himself about his odd distrust of Rogue when he fully accepts Scarlet Witch, both former members of Magneto’s Brotherhood Of Evil Mutants, that is so unnecessary and takes time away from the story. I’ve heard Claremont love his exposition and this certainly proves that. The art is also not the best. I’ve seen worse, even in 90s Marvel, but there’s still a lot of off facial features. Recommendation: Not a bad start but there has to be a reason I didn’t finish the miniseries. It could be the story and we’ll find out in future reviews. Then again I can’t remember why I stopped Thunderbolts either. Posted by ShadowWing Tronix on December 18, 2018 in Marvel Spotlight, Yesterday's Comics and tagged Iron Man, Johnny Storm, Marvel Comics, Marvel Super Hero Contest of Champions, Marvel Universe, Psylocke, Rogue, The Human Torch, Tony Stark, X-Force.